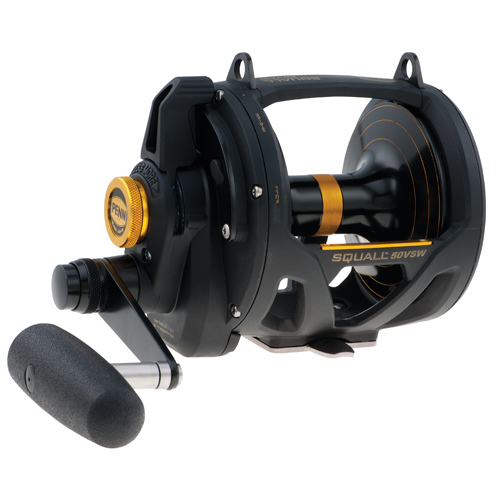 Penn Squall Lever Drag 2-Speed Reels offer great fish fighting features. In addition to the Quick-Shift 2-speed system, the Squall Lever Drag's graphite frame and side plates house tough, machined stainless steel main and pinion gears that are drilled out for weight reduction. Four shielded stainless steel ball bearings deliver smooth cranking power and the Dura Drag system eliminates hesitation and surging under extreme drag settings. The spool is made from forged and machined aluminum with the added touch of Line Capacity Rings to keep the angler in the know at a glance on how much line remains on the spool. The double-dog ratchet anti-reverse eliminates back-play in the handle and is twice as strong as a typical single dog system. - Line Retrieve: 33" / 17"